2019 Update: Splash! will not be holding a summer triathlon this year, but we still have our scholarship program. Please give us a call at #262-512-7946 to learn more. Thank you. Please feel free to click on form (which will open up to attachment page), print, fill out & bring to Splash! We also have these forms at the front desk. Thank you! *Wisconsin Meat and Sausage Co.
And More! See you soon!! Thank You to everyone that attended our 2017 Splash! 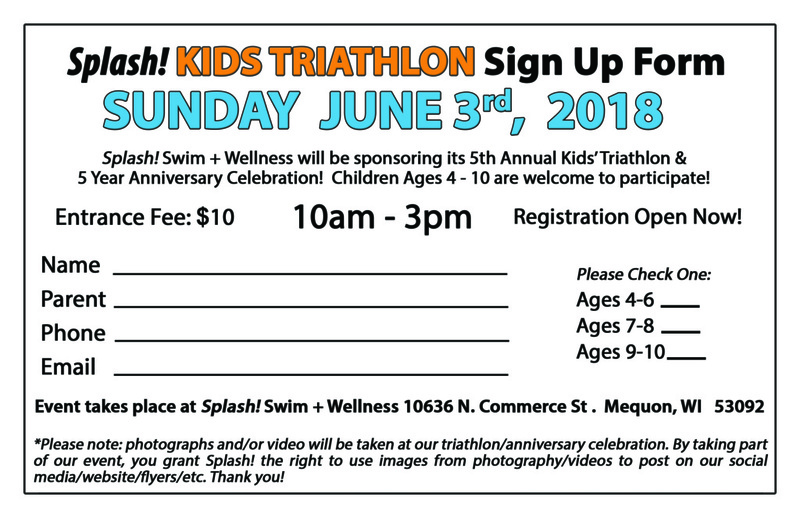 Kids Triathlon. We had such a blast! Everyone did amazing & we are so proud of all of our triathletes. (2017) Participants can bring any form of bike they wish, and they can also use a noodle to help with swimming if needed. The Entrance Fee is $10/participant. Profits made from this triathlon will go to swim scholarships! Please call us #262-512-7946 or stop by the front desk @ Splash to sign up! We are very excited for this event! We hope you can join us, and we would greatly appreciate it if you could share this event with your friends as well. Everyone in the community is invited! (Donges Bay Road & Commerce Street – follow Commerce St to the end.) Free parking. THANK YOU to ALL the participants, families, volunteers, sponsors and staff that were involved in The Splash! 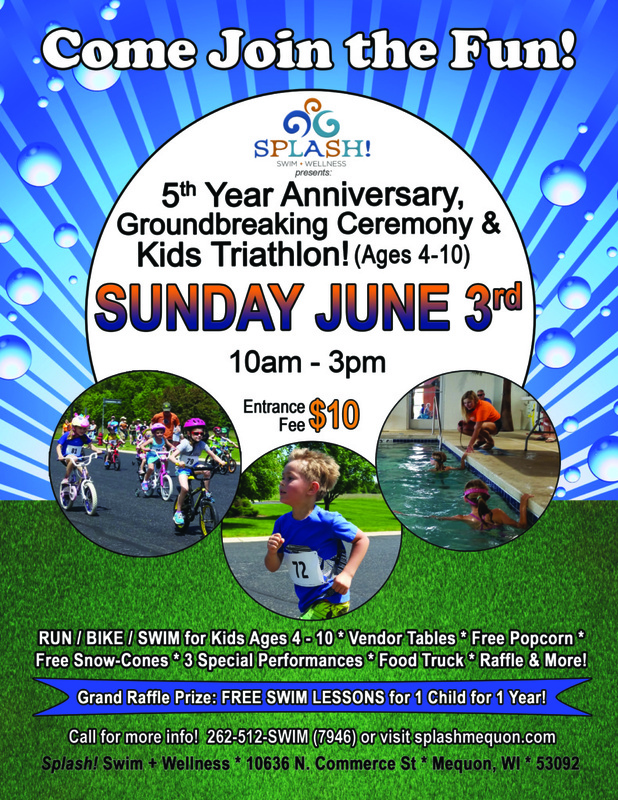 Swim + Wellness 2016 Kids Triathlon on SUNDAY, MAY 15th, 2016! We had an AMAZING time with you all! 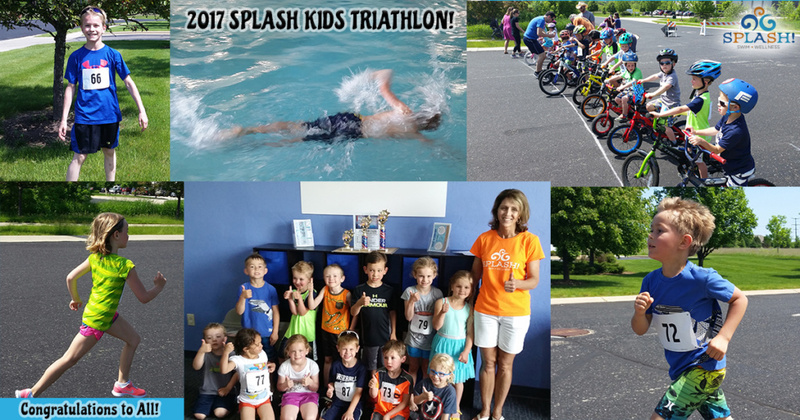 All the kids gave outstanding performances in all 3 of their events – Run * Bike * Swim! Congratulations to all our trophy & ribbon winners. You were ALL WINNERS! Afterwards, we had so much fun with you at our Kids Carnival, Bounce House, and Awards Ceremony! We also all shared in a special Goodbye to 1 of our favorite Splash Staff, Miss Shelby, as she goes on to pursue a new career in Real Estate! 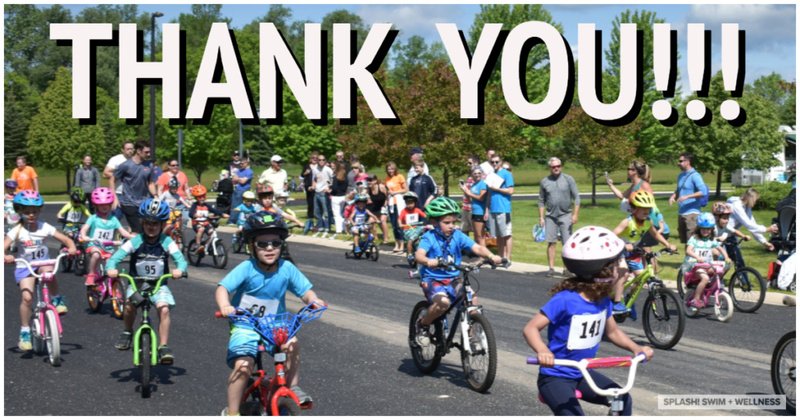 And THANK YOU again to our Awesome Triathlon SPONSORS this year: Soerens Ford of Brookfield * Libby Montana’s * American Bank * Nicole Walsh with Shorewest Realtors * Suburban Rental, Inc & all volunteers who made this event possible!! Money raised during our Triathlon events goes toward swim scholarships. 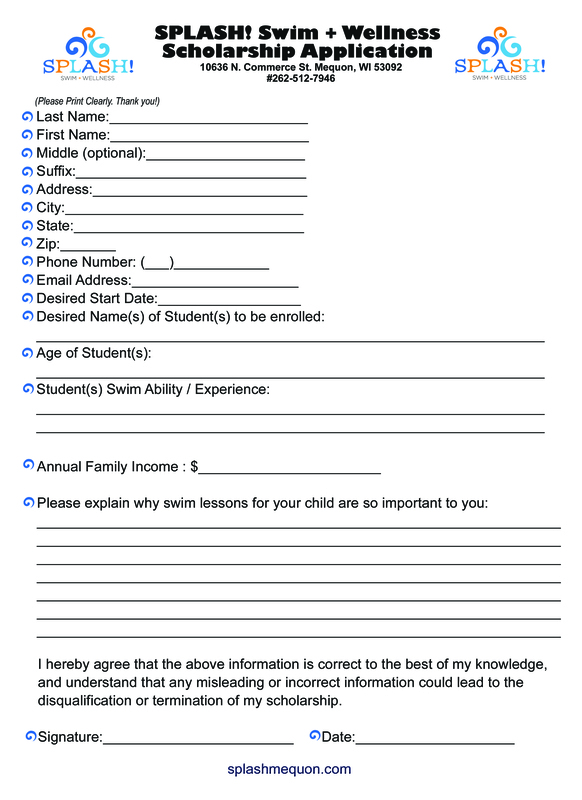 Please fill out the application at the bottom of this page if you are interested in applying for a swim scholarship. We are always accepting applications. Applicants must have an annual family income less than $50,000. Students who are applying to be covered by the scholarship must be 4 years or older. Please save jpg below to your desktop, print out (full sheet dimensions) and complete application. 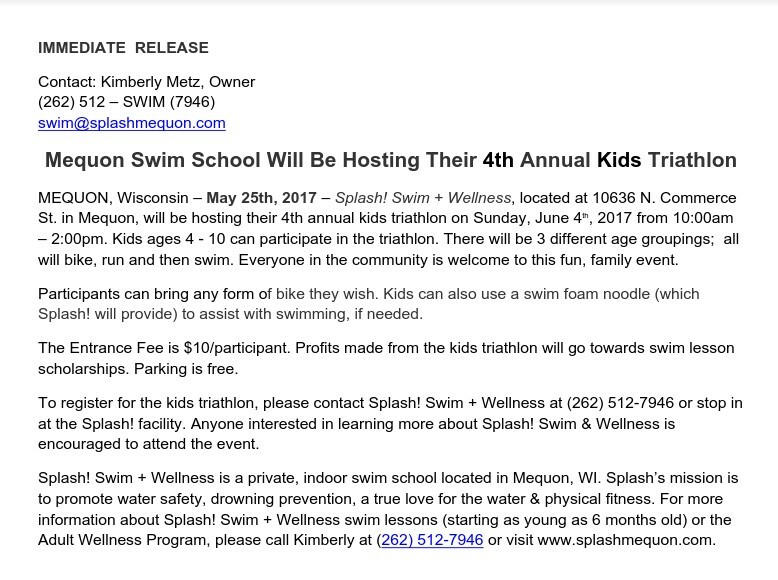 If the format below does not work for you, please email us at swim@splashmequon.com, and we will email you the PDF version. Please attach proof of income (tax return or a month’s worth of wages) and child’s age to the completed application. Applicants must be registered for any learn to swim session within two weeks of being awarded the scholarship. Any scholarship student who misses more than 2 weeks in any 1 session will be removed from the scholarship program and disqualified for future scholarship periods. Medical or family emergencies will be handled on a case by case basis. All applicants awarded scholarship will be covered for continuous swim lessons until they are passed into level 4. If an individual discontinues their continuous lessons, they will be withdrawn from scholarship but may reapply in the future.